The grand prix weekend that seals the deal for Hamilton's 4th title. What stands out here is how aggressive Mercedes have gone with their tyres. I wouldn’t say that, most teams have done the same or gone even more aggressive. It’s more that Ferrari and Red Bull have gone conservative as they are the odd ones out. They have almost bang on the average amount of softs, supersofts and ultrasofts. Not compared to Ferrari and Red Bull. What Sauber or Haas have done isn't really relevant to the point made. Ferrari need to win here to carry any worthwhile momentum into 2018. If Vettel can't stop Hamilton's run of beating him soon, he might as well write off 2018 as well because LH seems to be on an upward curve at the moment even if the car is not. He is getting results regardless if the car is doing it for him or not. However, I reckon Redbull have a good chance of beating Merc and Ferrari here. They do well at twistier tracks and Merc apparently doesn't do so well in the hotter places. 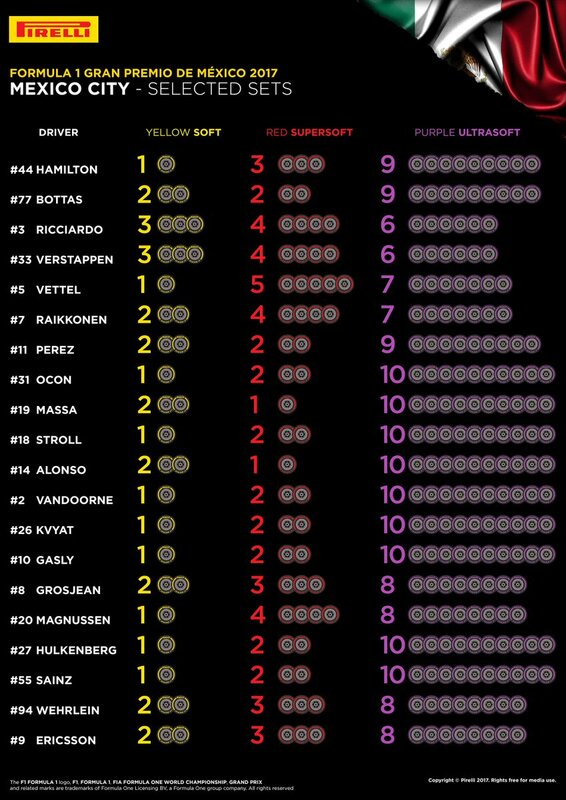 What will Kvyat be doing with all those tyres without a car? Such a shame he isn't here really. He looked extremelly strong here in 2015. Although he only beat Ricciardo by 0.001 in qualifying, he looked stronger in the race. Bottas managed to split Ricciardo and Kvyat and Kvyat looked all set for a podium until Vettel crashed. After the safety car, Bottas and Kvyat pitted. Kvyat stayed ahead but Bottas closed right up on him and when the race restarted, Bottas did that perfectly. But I do think that Kvyat will have managed a podium if not for this. He was only 16 seconds off the Winner too. I still don't think he should be out of F1. He's still young and he easily could be capable of getting back to his 2015 forum or better. But I guess he didn't show it when he needed too. But he did have terrible luck those 2 seasons. Ericsson also had what was probably his career best race here in 2016. Finishing 11th in a Sauber when only a Manor retired is pretty impressive. He's been stronger then Wehrlein in qualifying recently and also looked very competitive in the USA during qualifying and the race so lets hope he can continue good pace here. I'm hoping Bottas will be better here. He seemed strong at this circuit in a similar way to Russia. If he beats Hamilton once again this year, I think this is his most likely chance, but I'm not sure it will happen. 2018 will be a new start. What happens at the end of this year will not matter. Ferrari have been the best car on the tight twisty tracks so far. I think Vettel will be on pole. Not anymore. Mercedes is way ahead of the development game. Ferrari have fallen way behind somehow after a brilliant start. The only way they win is if Lewis takes his foot off the gas, no pun intended. Really sad to hear this. Ocon & Checo had their ups & downs but fans can't always be made happy if their favourite driver loses / crashes / finishes second best etc. Surely Ocon would be a little apprehensive this whole weekend. Alonso has been handed a 20 grid position penalty and Stoffel has been given a 35 position penalty. Both related to changing engines. Another spectacular performance from Honda. Has even a single Honda engine lasted as long as it has been designed to? Vettel and Ferrari seem to be untouchable in sector 3. Hamilton well behind Bottas so far. You couldn't make it up with Honda right now. Stoff's new unit has gone and is being replaced with yet another new unit. Celis Jnr has just totaled Ocon's car, pay driver's without the necessary license points shouldn't be on the track in the first place and that includes Galeal. French fans of Ocon may consider this sabotage! A Honda engine can't last a single session and yet people continue to state that McLaren should have stuck with Honda. And they've done it for 3 years in a row. Height of patience? I dont think that is it. Either they hate McLaren and express it that way, or they truly hate Renault. It's over, now. Why are you flogging this dead horse? Really? It's a binary choice? The only thing that is over is Stoff's latest Honda engine. If YOU dont want to talk about it then YOU are free to NOT post. Lotus49 brought it up and it's a valid topic. I think next year will be more eye opening for most people. When Toro rosso will be the slowest car on the grid and hopefully Mclaren is competing at the sharp end. Honda just hasn't done anything at all to show that they are getting better. Does anybody know why Hamilton is so slow? Does anyone know what the different compounds bring to the table in terms of lap times? Not at the moment the track is still far to green and is giving little grip. I agree with you completely. Honda has proven to be nothing but feckless as this year comes to an end. Virtually no improvement whatsoever. They are as unreliable as they have ever been. Usually it's about 0.5-0.6sec difference between each step of compound. Vettel would have blown away the Bottas's time if he did a run on the ultras. He almost matched Botta's S3 time on a harder compound much earlier in the session. The Redbulls are also in the mix. So unless Lewis figures it out and can find his most usual half a second over Bottas, I foresee Vettel and Ferrari as the favorite for pole. OK, thanks. Do you mean usually at this track specifically? I don't think much can be read into FP1. If its usually 0.5-0.6 and Vettel was 0.762 behind what makes you think he'd have blown away Bottas time? You could argue Bottas set his times first.